Richard Denning has dropped me a line reminding me of the details for the second UK Games Expo. After the success of the first, it is back in 2008 bigger and better. The event takes place on 31 May – 1 June 2008 at the Clarendon Suites in Birmingham. The latest newsletter is here and includes details of the highlights. I guess the major scoop is the appearance of the 4th edition of Dungeons & Dragons a week before it is due to be published, which should keep the roleplaying crowd happy. The main thing of interest for me will be the debut at last of the Ragnar Brothers new game, Monastery. This was only advertised at Essen, after failing to be ready in time for that show due to the artist breaking his hand if I remember correctly. For those wanting full details about the event, the main UK Games Expo site isÂ hereÂ and there is a Boardgamegeek forum thread here. Hope everyoneÂ is havingÂ a good Christmas. My parents are coming over today and, if everything goes to plan, I should be getting a copy of Darjeeling from them. Darjeeling is a game designed by Gunter Burkhardt and released by Rio Grande and the theme is unsurprisingly about the tea trade in India. I ought grudgingly to mention that after years of waiting (and in some games this year, it certainly seemed like years of waiting!!! – only joking), Nige has triumphed in the 2007 Hall of Fame. A tastefully designed note has been added to the Trickylight homepage to celebrate the fact. Finally for now, over the break, I am working on a new feature for the site: Six Picks, which is sort of a recommendations area for various categories of game. The first one is likely to be Six games the family should play at Christmas, as I’m still feeling in festive mood. This week, we played one of the most attractive looking games from Essen 2007: Galaxy Trucker, designed by Vladimir Chvatil (who designed Through The Ages) and released by Czech Games Edition. 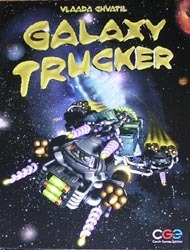 The basic premise of the game is that you manage a galactic trucking firm and you put together makeshift spaceships and explore the universe trying to make your fortune in cosmic credits. The game is played over three rounds and each round has two phases. Firstly there is a timed mad dash where you draw random face-down tiles (components) in an effort to build your ship before everyone else does, while making sure its structural integrity is sound. A poorly constructed ship will not last long against the ravages of deep space. Tiles consist of crew cabins, freight cabins, Guns, Thrusters, life support units and connectors, all of which must be linked together within the confines of your shipyard. At the start, you can only build relatively small ships but in subsequent rounds, your shipyardâ€™s capacity increases so you can build bigger and better ships. The earlier you finish, the better your position in the exploration phase. So, once everyone has completed the building phase and the inspectors have confirmed your ship is space-worthy, you set out to boldly go where no other space trucker has been before. The leader flips a series of cards from the “event” deck, and players do their best to navigate their way through these. Some allow you to collect goods from planets you encounter, others present meteor showers, smugglers, slavers and pirates who come to steal your goods, crew or simply to blow bits off you. So, your ship falls apart slowly as you fly it, which is fun to observe and quite tense as to whether you will be able to complete your journey. If you arrive safely, you get to sell the goods you transported and get rewarded for your position in arriving and if you have the most presentable ship. After three build / explore rounds, whoever has the most cosmic credits wins. You canâ€™t call this game terribly strategic as there is too much randomness in what can befall you with the event cards. It is more an experience game and is quite fun as such although might be a little long for this. Itâ€™s not a game that Nige was likely to enjoy as it has a spatial awareness aspect to it and a fair amount of time pressure. The puzzle element of trying to find pieces with the right connectors was interesting but I was never sure what the right balance between crew cabins, cargo holds, battery units, cannons and thrusters was likely to be and in a couple of rounds forgot to get at least a decent amount in one of these areas, particularly in the final round when I forgot about my crew cabins and ended up with a paltry four humans and one alien. The fact that one of the first events was an encounter with slavers who were more than enough to polish off my guys (and those of Mark K) meant that our final adventure was more like an episode of Lost in Space. Nevertheless, Mark K had in this and previous rounds concentrated on shipping the most valuable red goods and collecting and selling these was the key to his victory. 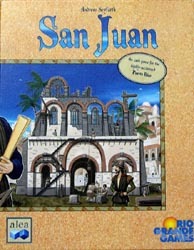 We finished up with a game of San Juan, which we all know and enjoy a lot. Unfortunately, while this is normally a game I do really well at, this session cemented Nigeâ€™s Hall of Fame victory. I was able to build an early library and was working towards getting production buildings and a Guild Hall but I never saw a Guild Hall all game and, in fact, didnâ€™t see any six point buildings until right at the end. I did build a Palace but my other buildings werenâ€™t valuable enough to get me enough of a bonus. Nige, on the other hand, built an early Triumphal Arch and took the full bonus by being able to build all three monuments. Although this meant he had to forego some building opportunities, he was still able to amass more than enough points to grab the final win of 2007. Well played! The latest issue of Spielbox landed on the doormat a couple of days ago. Lots of coverage of the Essen fair and reviews of Tribun, Cuba, Darjeeling, Alchemist, Ming Dynastie, the latest version of Condottiere and Galaxy Trucker. Also included was a mini six-card expansion for Pillars of the Earth, which can be played with both the original and the 5/6 player expansion. More details of the issue at Spielbox online (German only but with a link to the English rules for the Pillars expansion). Just a reminder that the next session will be on Friday 21st December at Garry’s house and will be the final one of 2007. Can Nige hang onto his Hall of Fame lead? Surely, even he couldn’t lose it from here! 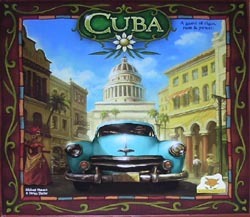 This week, we were back down to five players and so I thought it was time to try out Cuba, the new game by Michael Rienick and Stefan Stadler that is published by Rio Grande. The game is about developing your plantation estate to score the most VPs over six rounds. Players earn victory points by shipping merchandise from the harbour, by erecting and using buildings, and by abiding by the law. Each round, parliament declares four bills that can be voted into law during the round. Players then take turns carrying out actions allowed by their five character cards. Only four of these actions are carried out with the final character being used for the voting. Actions range from extracting resources and products from your plantation, spending resources to erect buildings, trading in the marketplace, using the special functions of your buildings and shipping products and goods off the island. When the vote comes around, players can use pesos to buy extra votes and then whoever has the most votes chooses two of the bills to pass into law. Each of the laws is then checked to see if players can abide by it and, if they can, they are rewarded with VPs. The round ends with some tidying up where players lose any products that they havenâ€™t been able to store and the ships in harbour are rearranged. After six rounds, 2 VPs are awarded for each building a player has built and whoever has the most VPs wins. This was a great game with loads to think about and various strategies to pursue. As is usual with our first playing, this meant that the game took longer to complete than it should. One culprit who had a vested interest in restricting the number of games we manage to get in before the end of the year (due to the hall of fame standings) should have been locked up and the key thrown away for his delaying tactics. One turn, he spent several minutes deliberating before deciding merely to use the tradeswoman to take a single resource. The long term strategic importance of this play failed to register with Mark K and me, particularly as the guilty party was so far behind in VPs he wasnâ€™t likely to win. Mark K played a good game, generating plenty of income to help his plans. Like me, he was able to get some cheap products at the market (which was not used too regularly in this playing). This stockpile and some cigar boxes allowed him on one shipping action to completely fill the most lucrative ship for 15 VPs and he never looked back, although Steve did his best to keep up by using the law that gave VPs for votes cast in parliament. However, Mark K still won to the relief of Nige. Trying to find the reason for buying a second warehouse on BGG afterwards, I discovered we did play a significant rule wrongly. We played that the foreman activated all buildings whereas the rules say you chose between using only those orthoganally in line with the worker or a single building. This would give yet further things to think about and warehousing would not be the automatic benefit that we picked. I donâ€™t think the way we played harmed the game but Iâ€™m interested in how much it tightens things up. Cuba was very enjoyable and had lots of mechanisms that we thought clever. We particularly liked the way the statutes impacted play, the way the buildings lessened the opportunity to get resources or products, and the shipping process. Getting combinations of buildings that worked together was important and this is a game I can see not becoming stale due to the variety of approaches you can take to generate your VPs. Next time, however, we need to play a bit quicker. 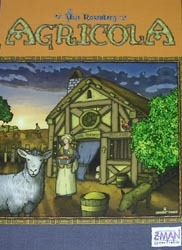 Agricola seems to beÂ one of, if not the biggest, hits of the Essen show. I didn’t pick it up due to the text-heavy German cards but Z-man Games has now come to the rescue. They set up a preorder programme with the promise that they would publish an English version when they got 750 preorders. I signed up pretty much straight away but they have now confirmed that they have already exceeded 850 preorders so the game is set to be produced (hopefully) by April. The preorder remains open until the end of the year and, for those signing up, Z-man have said that there will be a bonus deck of cards and possibly animeeples rather than plain cubes. Those interested should look at the info on BGG and this thread about the preorder process. The latest issue of Counter is now out. As usual, the post-Essen issue is filled with views on the latest releases from the greatest game show in the world. With detailed reviews of 1960: the Making of the President, Agricola, Cuba, Galaxy Trucker, Hamburgum and Key Harvest among others, it is an interesting read as always. Alan How also reviews Kingsburg, a game I passed on due to it being sold at 50 euros for the English version (rather than 40 euros for the German) but it looks like the game I most regret leaving behind. Well, with last week’s scheduled session being cancelled due to lack of committed players and me having won the real life ‘Dancing Dice’ competition at our office 70’s Christmas party (edited highlights will be on Youtube soon – next century, perhaps), I’m feeling refreshed for our next session on Friday 7th December at my house.